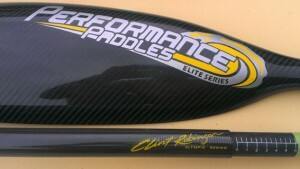 Just arrived in Europe the 100% carbon Clint Robinson signature Performance Paddles. Designed by an Olympic Gold medallist kayaker and multi World Champion ski paddler. These paddles are for turbulent surf conditions and are used by the best ski paddlers in Australia. Performance Paddles are comfortable in the hand in surf and don’t have a tendency to twist like the K1 paddles which are principally designed for paddling K1 or K2 kayaks on flatwater.